It’s cold outside, but if you’re planning a spring wedding, you’ve probably spent time already working on the planning basics. Now is the time to make a full checklist to be sure you’ve covered all the details, like caterers, hair stylists, makeup artists, and other professionals that you’ll want to book soon. Here’s a quick checklist to make sure everything is covered. The venue. Normally, the venue should be booked a year in advance. If you haven’t done so, don’t panic, but be sure to get this checked off your list right away. If your perfect venue is full, think about other options, like local theaters and other unique venues that may rent out space – they might still be available for your date. The dress. It’s also advised to buy your dress a year in advance, but you have a few months left, so it’s not too late. Get to the stores as soon as possible to find your perfect dress, as well as the bridesmaid’s dresses and groom and groomsmen’s formalwear. Be sure you have enough fittings scheduled for everyone so that everything fits perfectly on your special day. The caterer. This is also something that should be done right away, to ensure that the food you love is served on your special day. Ask local caterers about their availability, and always sample their food before booking. If you’ve already booked, be sure to select your menu soon. The cake. Now is the perfect time to order your wedding cake. Ask people you know for recommendations or taste some samples at local bakeries. Look online for some ideas for cake designs or ask the baker for a sample book with their past work for some great ideas. The flowers and decorations. With a few months in advance, it’s time to order flowers and other decorations, so visit your local florists. You still have some time to make some decorations yourself, so schedule some get-togethers with the wedding party for some crafting or book a local decorator to create the perfect setting. Also, ask your venue if they provide any linens or decorations. The limo. If you’d like to be whisked away in a luxury limousine, now is the time to book one. Ask for references from previous customers to ensure you’re renting from a trusted company. The rehearsal dinner. If you’ll have a special venue for your rehearsal dinner, book that now as well as the caterers or decorations you’ll need. The hair and makeup. 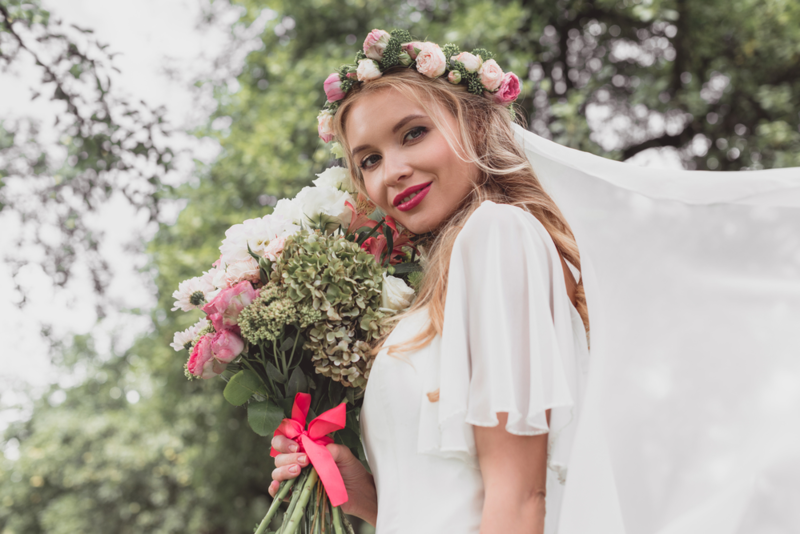 Finally, now is the time to connect with your stylist and makeup artist about creating the perfect look for your special day. With a few months left, you have time to try a few styles to see how they look or grow out your hair for a longer style. Have a special day coming up this spring? Congratulations! Make your bridal hair and makeup reservations today at Voga Salon. We offer a variety of bridal packages to help your team look and feel their best for your special day! Find us at 13357 West 135th in Overland Park or call us at 913.685.1832 to book your bridal package today. In the meantime, you can manage your regular hair and makeup appointments on our free mobile app, available on iTunes or Google Play.